For as long as I can remember, pickled eggs and beets has been served every Easter. They go great with ham and look so pretty on the relish tray next to the pickles and olives. 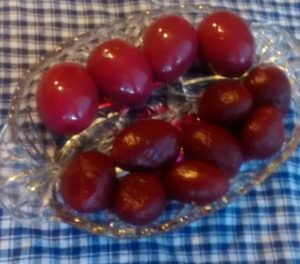 Nowadays I don’t just make this easy pickled eggs and beets recipe at Easter time, I also make them for Thanksgiving, Christmas or any other time that I am in the mood. Pickled Eggs and Beets are also known as red beet eggs or PA Dutch pickled eggs and beets. If you do check out one of the many PA Dutch versions you will see that they are usually loaded with sugar (which is very common in a lot of Pennsylvania Dutch recipes). Personally I don’t like all that sugar. And besides, red beets are naturally sweet anyway. Pickled eggs and beets are so easy to make and an economical recipe as well. They also work great as an appetizer, side dish and can even be part of a meatless meal. After all, you have the eggs for the protein and beets for your veggie so you could just add a nice side. They also dress up a simple sandwich meal. I served them yesterday along with ham barbecue sliders. I have had pickled eggs so many ways but this is my favorite. Some like them sweet while others prefer less sugar. Even those who don’t care for beets often love the flavor of the eggs. And if you like beets but only eat them hot then these cold pickled beets are quite a treat! Peel and rinse hard boiled eggs and place in a large container (I use my lock n lock containers because they don’t stain but glass jars work great for this). Drain beets, reserving the juice, and pour beets over the hard boiled eggs. Cover and keep in the refrigerator until needed. Pour reserved beet juice, vinegar, sugar, whole cloves, salt and pepper into a non-reactive saucepan (such as stainless steel). Bring to a boil over medium heat, stirring occasionally, until sugar is dissolved. Remove from heat and allow to cool for about an hour or so. Add sliced onion to the eggs and beets then pour beet juice mixture over all. Cover and give the container a little shake make sure the eggs are all covered. Refrigerate at least 24 hours. Place prepared eggs and beets on a pretty relish tray and slice eggs in half lengthwise if desired. Before serving you want to make sure to remove the whole cloves that might have stuck to the eggs and beets and put them back in with the rest. I don’t know if they are a choking hazard (especially with little ones) but it’s better safe than sorry! Pickled eggs and beets keep in the refrigerator for about a week and taste even better on the second or third day. This recipe is so easy to double or even triple. For holidays (when I need to make a lot) I place in gallon size pickle jars. If you buy these huge jars of pickles or know someone who does just ask them to save the jar for you. This recipe was actually adapted from both my mom’s and Emeril Lagasse’s. I prefer these Emeril’s way with the apple cider vinegar (my mom uses white) but prefer whole cloves over pickling spice. Both ways are delicious though and this is a great recipe to make your own!